A major earthquake has hit Kyrgyzstan, killing at least 65 people, officials in the Central Asian nation say. The 6.6-magnitude quake struck at 2152 local time (1552 GMT) on Sunday, destroying more than 100 buildings in the southern province of Osh. Rescue workers are still searching for survivors under the rubble, the emergencies ministry said. Destruction was concentrated in Nura, a village in the mountains close to the border with China. Health officials said the remote location of the village was hampering rescue efforts. "The picture we saw was frightening," Emergency Situations Minister Kamchybek Tashiyev was quoted as saying by AFP news agency. "The village of Nura is fully destroyed, 100%, there are many injured." 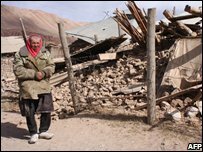 People throughout Central Asia felt the quake. The US geological survey said its epicentre was in Tajikistan and initially estimated its magnitude at 6.3 - although it later revised that to 6.6. Officials in China's Xinjiang province reported minor damage to houses, but so far no casualties have been reported there. In Kyrgyzstan, emergency ministry spokesman Abdusamat Payazov said many areas of the country had experienced the tremor. "In Osh the quake was registered at 6 in magnitude, in Batken region 5 to 6, and in Bishkek up to 3.5," he told the BBC. Russian President Dmitry Medvedev, due to visit Kyrgyzstan later this week, sent his condolences in a telegram. He said that he was ready to provide humanitarian assistance. Kyrgyzstan is a landlocked nation of five million people. About 90% of the country is mountainous, and seismological events are common. Over the past two years there have been two large earthquakes in Osh and Naryn areas.